Actually the Three Brothers are just full of joints, and that's the problem. If any legends exist concerning the rocks known as the Three Brothers in Yosemite Valley, they have not come to me via the anthropologists or the internet. The rocks seem have been called Wa-ha'-ka, Wawhawke, or Kom-po-pai-zes, with meanings that include leaping frogs, couples enjoying each other (to use a family-friendly description), or the one that makes the most sense to geologists, "falling rocks". Rocks fall in Yosemite on a constant basis, but the Three Brothers are prizewinners in that regard. The rather boring English name came from a historical event when James Savage's militia (the Mariposa Battalion) caught up to three of Chief Tenaya's sons near the base of the rock in 1851. It's a pretty mundane name, and I would really love to see a campaign started to officially re-name all of Yosemite's most prominent rocks with their ancestral First Nation monikers. In any case, Wa-ha'-ka is a unique cliff for the three striking peaks, Eagle (the highest), Middle Brother, and Lower Brother. The triangular shape is derived from the joint pattern that courses through the cliffs. 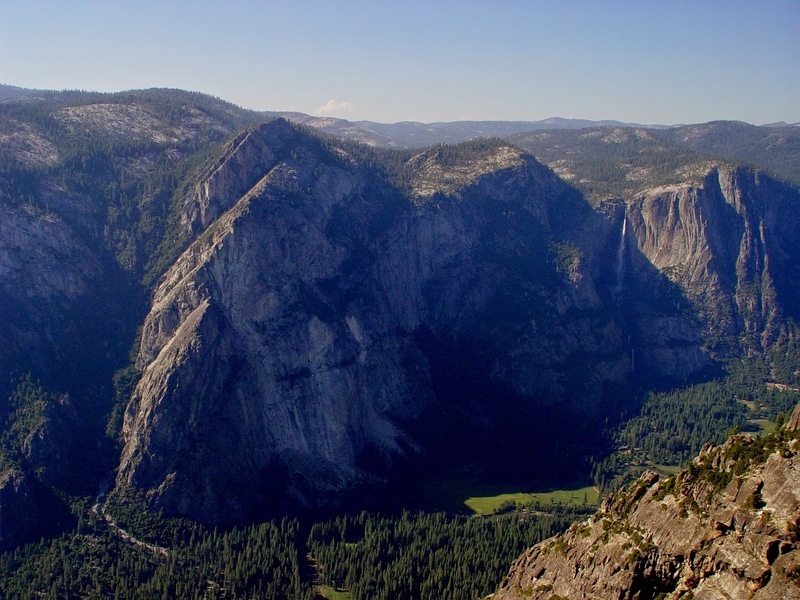 As mentioned previously in this short blog miniseries on Yosemite, joints are the fractures that occur in granitic rocks as they reach the surface and come under lateral pressure from nearby fault zones or regional stresses. There are two intersecting joint systems that formed the Three Brothers, one descending about a 60 degree angle. 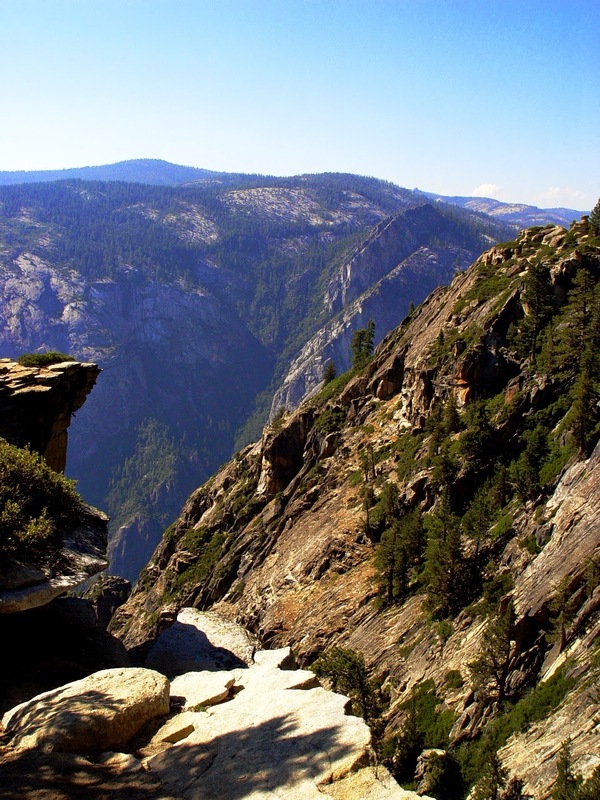 It can be seen best from across the valley at Taft Point, and the related Taft Fissures. 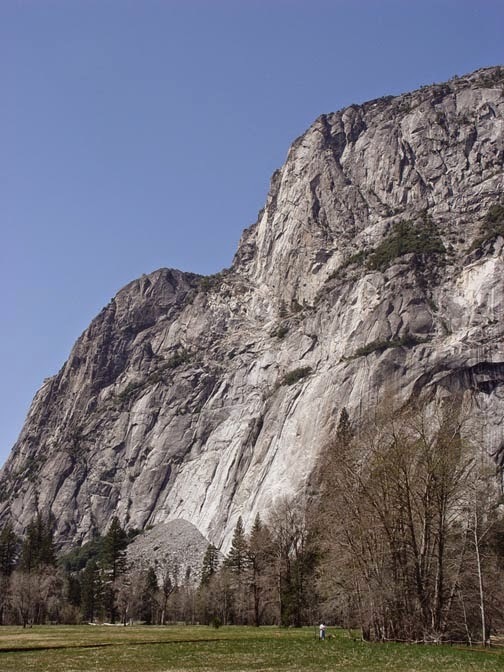 The joints run through El Capitan granite and Sentinel granodiorite. Notice in the photo below how the slope in the foreground near Taft Point is angled the same direction as the joints at Three Brothers across the valley. There are many good reasons to make the short hike out to Taft Point, and this is one of them. There is a very good reason thinking that First Nation name of the rock means "falling rocks". Crossing joints provide the instability that leads to slope failure. 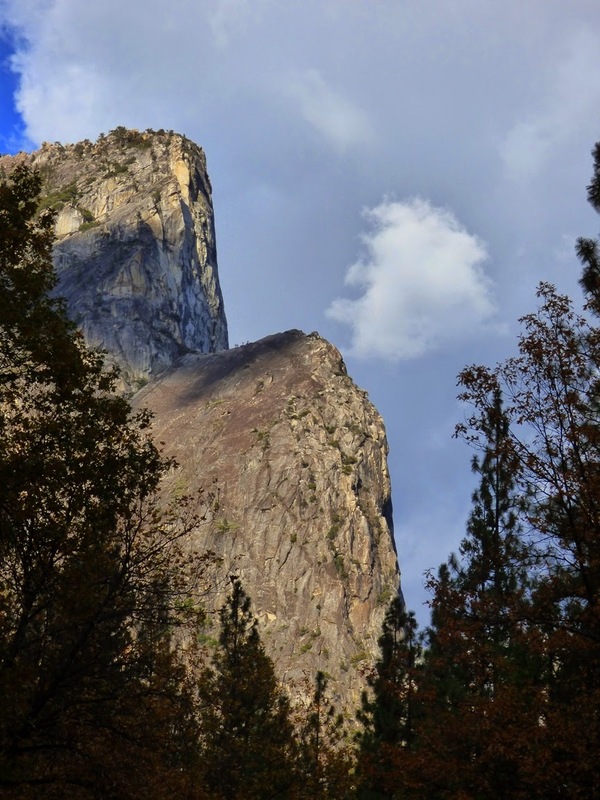 The rocks here fall often, and indeed in 1987, the largest recorded rockfall in recorded history at Yosemite took place at the base of Middle Brother. Thankfully the park road had been closed as a precaution and no one was hurt. 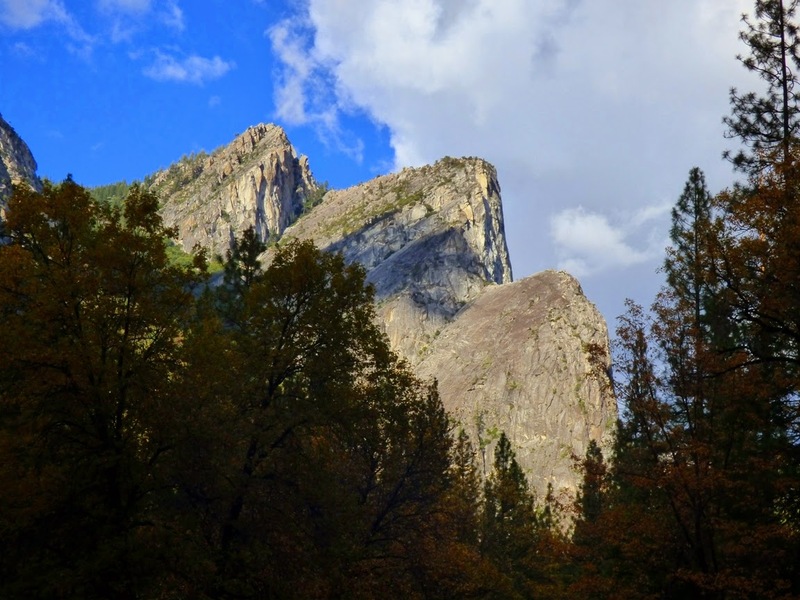 At 2:47 p.m. PST on March 10, 1987, a large rock fall dropped 800 m from the face of Middle Brother and spread rapidly across a talus cone, covered Northside Drive, and sent boulders across the Merced River. Much smaller rock falls from Middle Brother had begun on March 8, and by about 2:20 p.m. on March 10, because of an increasing number of rock falls and audible rock popping noises from the face of Middle Brother, Northside Drive, the main exit road from the valley, had been closed and the portion of Leidig Meadow below Middle Brother had been cordoned off. ...Jim Snyder observed the rock fall initiate as an intact planar slab of rock that separated from the cliff face. As the slab fell it appeared to shorten in a folding-like manner similar to the steps of an escalator. The slab disaggregated into a rock avalanche upon hitting and sliding along a prominent ledge before falling onto the talus cone below. Another large rock fall from the face of Middle Brother occurred later that day at 5:10 p.m. The volume of these rock falls totaled an estimated 600,000 cubic meters of material weighing about 1.3 million metric tons. Dozens of smaller rock falls continued during the next several days..."
*Wieczorek, G.F., Snyder, J.B., Alger, C.S., and Isaacson, K.A., 1992, Rock Falls in Yosemite Valley, California, U.S. Geological Survey Open File Report 92-387, 186 pages.